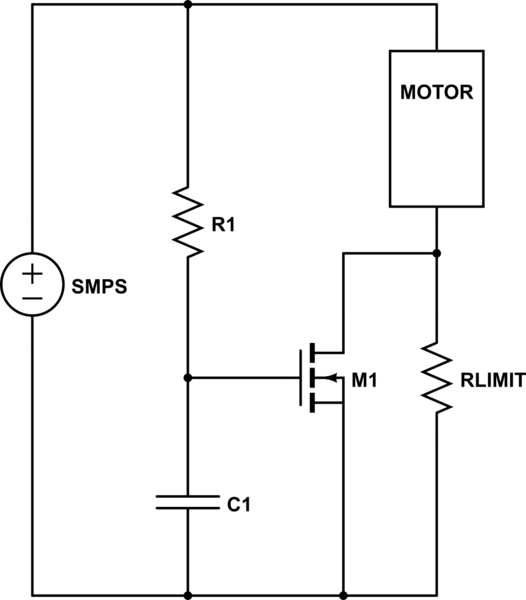 I want to supply power to a motor from a SMPS power supply. But the problem is SMPS supply have a feedback loop and a fail-back mechanism, so on the startup motor shows a near zero resistance [according to the electrical model of the DC motor ]. I don't have privileges to open up the SMPS unit and bypass that mechanism. So I need to find a walk around on this. Any idea guys? I know motor soft starter unit will work, but I don't have that luxury to afford a one. Any other quick and dirty trick to make this work? Set the limit resistor high enough to keep the SMPS from current limiting, and the RC for enough delay to let the motor get up some speed. The relatively slow rise of the gate voltage will allow further motor acceleration during turn-on, but make sure the FET is beefy enough to a) do a good job of shorting the limit resistor, and b) soak up the power dissipated during turn-on. Not the answer you're looking for? Browse other questions tagged motor dc switch-mode-power-supply or ask your own question. Can a lighting transformer be used to power a pump? SMPS (LM2678) what transformer to use and why?